The first month of our Idaho Season promises to be pretty busy. Even though it's just Cinco De Mayo today, we're already thinking this is going to be one of those fast-paced months that disappear in a blur....over before you know they even got started. Early Tuesday morning we head north to Salmon River Country. We are scheduled to meet with Jeff C. at 11 am Tuesday in Challis to discuss the Salmon River Guide Project. Jeff has moved laterally in the BLM to a position down in Dolores, Colorado. His last day is May 4th so we have a lot of stuff to get done between now and then. We plan to stay on the Salmon River three nights, leaving to return here on Friday morning. If Jeff doesn't put us to work on the field work details of the guide, we will entertain ourselves by driving some remote backroads. High on our list is the Morgan-Panther Road. We first heard about it in 2004 and have been living to drive it ever since. The road begins 15 miles north of Challis where it joins Hwy 93. It then goes 64 miles straight north to the Salmon River west of Shoup. Once you arrive at the Salmon, there's only two ways to get back. One is to turn around and drive the same road again. The only other alternative is to go back through Shoup, North Fork and Salmon City to Ellis. We figure the trip will take at least 8 hours and it could easily turn to ten or more. It's a full on backroad adventure so we will have to take all the gear in case we get stranded. You can click here to see a map of the Morgan-Panther route. We doubt we will have time for a side trip to the Bighorn Crags. That remains TBD. There are lots of other places we want to go up in that neck of the woods. No matter how many years you've prowled that area, you will never see it all. Our whole idea for travel this year is to go out during the week and be back home for the weekends. 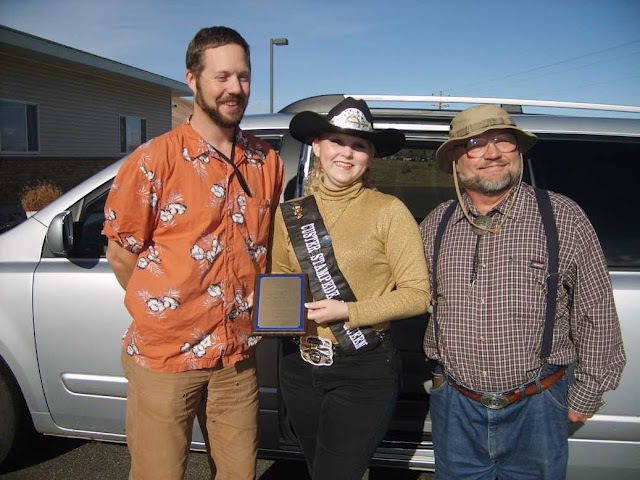 Weekends are when Idaho Falls really comes alive. One exception to this plan will be May 19-20. That's when we're booked into the Old House of Old Faithful Inn. The Old House portion of this sprawling facility was completed in 1904 when stage coaches still brought visitors to the caldera. We are very much looking forward to this trip. We will return on Monday after that Road Trip and stay through the upcoming Memorial Day weekend. The day after Memorial Day (May 29) we will head out to explore the lava deserts that lie south of Arco, north of Minidoka and west of Pingree. We will return on June 1st from that Road Trip. 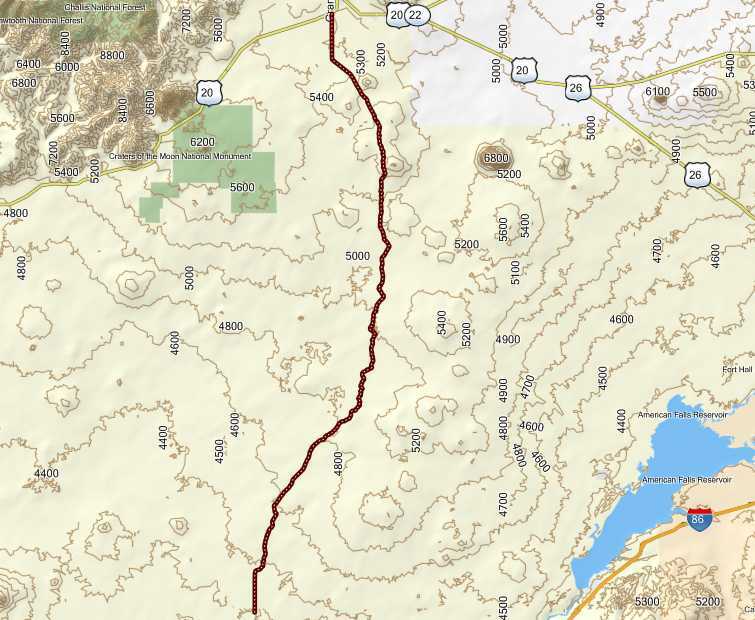 The goal of the trip will be to drive some or all of the Arco-Minidoka Road (AKA: The Great Rift Road), easily one of Idaho's more desolate remote roads. Idaho's most truly remote roads are arguably down in Owyhee Country. 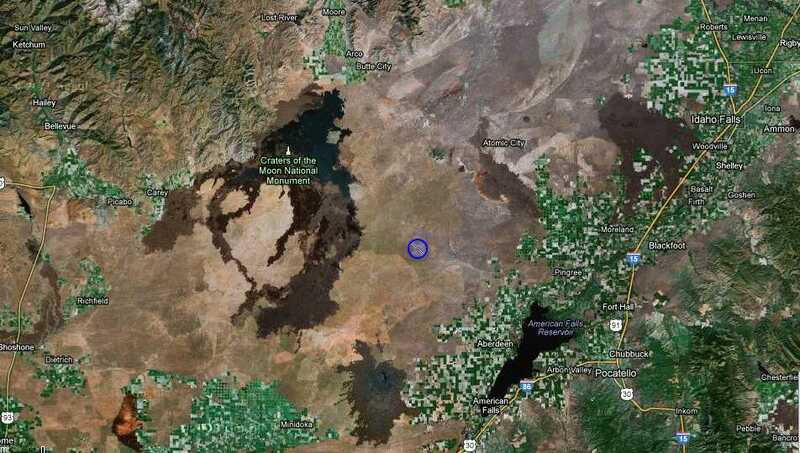 However, this lava deserts south of Arco are definitely one of the loneliest places in the state. Luckily, we will be able to take our ham radio with us on that trip. If we get in trouble, we will actually be able to summon help with the ham radio. That's a bonus. Two screen shots of the road's route and the general area are below. We don't know where we will base for this trip. We might actually wind up staying in a motel in Arco and one down in Minidoka County. That remains TBD. The road itself is 70 miles and we've heard you're lucky to travel at 10 mph on it. The late May timing ought to be perfect before the black lava gets super hot again in the summer. The roads and tracks should be bone dry and dusty by then with all the Samurai sucking mud holes dried up. We haven't even yet started thinking of what we're going to do in June. We have a pretty full Road Trip plate as it is. Hopefully by Memorial Day we will have a better idea of how June will unfold. July and August look to be occupied by visiting friends and the completion of our field work by boat up on the Salmon River. Hopefully, our Idaho Season won't fly by as fast as our just completed Arizona Season!